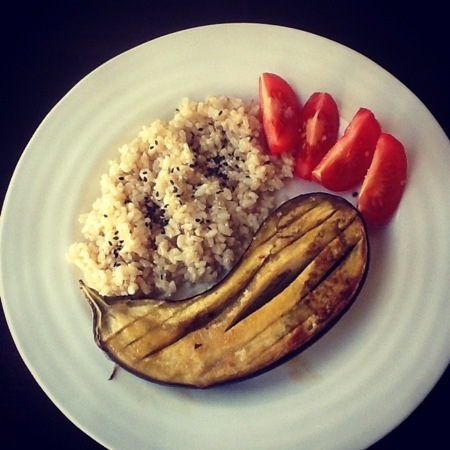 Nigel Slater’s Baked Aubergine with Miso Dressing | One Picture, A Million Words. I always called eggplants eggplants or brinjals until I started reading cookbooks written by British authors. Now, I call them aubergines because (1) it sounds more sophisticated and (2) it is like calling an orange orange. Get it? The colour of the orange and its name is the same. Ditto for the aubergine. It just makes sense! This aubergine recipe by Nigel Slater is taken from his book Tender: Volume I. The miso dressing is what made the dish. It soaks right into the soft fleshy aubergines and gives an addictive sweet salty taste that makes you go back for seconds and thirds. I served brown rice sprinkled with sesame seeds and chopped tomatoes on the side. I know the picture doesn’t look like much and the plate of food looks so plain but it was a really delicious meal. This is one of my favourite recipes for aubergines. It just needs a little planning ahead. The aubergines had to have about an hour in the oven to bake (they were on the bigger side) and by the time they were done, it was slightly later than when I usually serve dinner and my babies were hungry. But no matter, all went down well in the end. Yellow? That’s new to me!